Combine rub ingredients in a small bowl and rub all over steak. Chill 1 hour or up to overnight uncovered. Bring meat to room temp and preheat a grill pan or large, cast-iron skillet. Drizzle meat with oil on both sides and grill 8-10 minutes, turning occasionally for hanger steaks, 12-15 for flank. Let stand to carve. In a bowl, combine green chilies, finely chopped onion and garlic with juice from 2 limes and salt. Let stand. Place avocados cut side-down on the grill or in the cast-iron skillet. Halve the remaining 2 limes and char cut-side down as well. Add charred avocados to onions and chili peppers and mash into guacamole; add cilantro and taste to adjust salt. In another bowl, douse sliced red onions with juice of 1 charred lime, season with salt and pepper. If making the salsa, preheat broiler to high. Pulse-grind the nuts in a food processor and reserve. Line a baking sheet with foil and arrange tomatoes skin-side up, peppers cut-side down, onions and garlic. Spray everything with cooking spray and place in the center of the oven preheated to high and broil until charred, blacked and blistered. Let cool then peel tomatoes (a little char left on is fine), peppers and garlic. Place tomatoes, peppers, onions and garlic in a food processor and season with salt, pepper, cinnamon, cumin, coriander, honey or agave, and process to a chunky salsa. Transfer to bowl and combine with nuts; adjust seasonings. Slice steak and dress with juice of remaining charred lime. 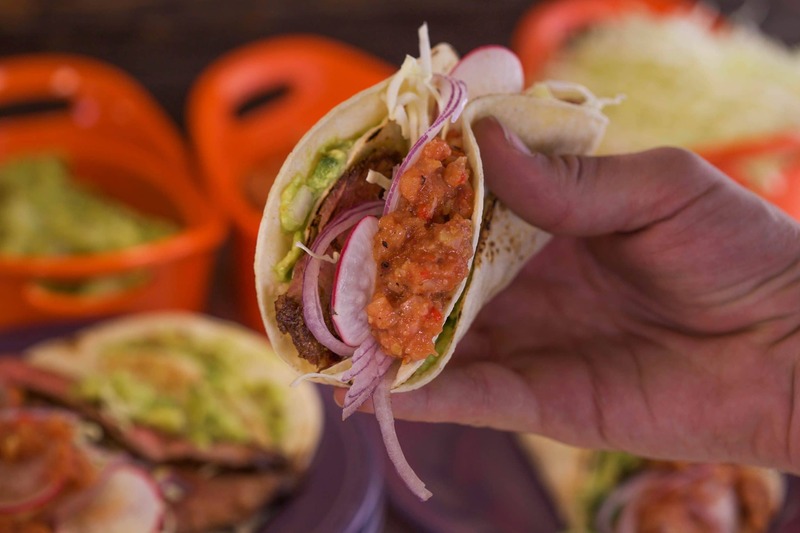 Serve sliced meat in tortillas with cabbage, radish, guac, red onions, salsa (optional) and hot sauce. In Recipes-list.com we have selected the most viewed recipes from category - uncategorized . Enjoy the best recipes specially selected for you! Steak Tacos with Smoky Guacamole is the right choice that will satisfy all your claims.